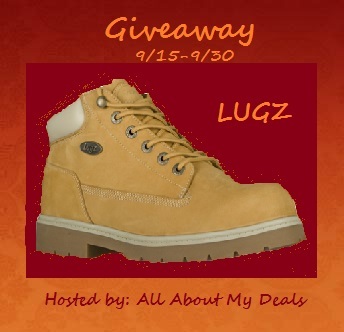 Product/company details: Lugz has been around for 20 years and offers high quality boots, casual and athletic shoes for men, women and children in a variety of colors. Hubby is a huge of Lugz from the work boots to the more stylish boots. They all look great, are durable and really offer boots that the whole family loves to wear. Eligibility: Open to US residents who are 18 years of age or older. How to enter: Complete tasks on the giveaway tool below to gain entries into the giveaway. Be sure to complete the sponsors tasks, as a thank you to them for sponsoring a giveaway. Note: Winners will be notified by email once the giveaway ends. The winners will have 48 hours to get back to the host. If the host is not notified a new winner will be pulled for that prize. Disclosure: Dragonfly Sweetnest is not responsible for prize fulfillment. If you have any concerns contact the host at: allaboutmydeals@gmail.com. This giveaway is not associated, sponsored nor endorsed by Facebook or Twitter or any other social networking site. I am disclosing this in accordance with the Federal Trade Commissions 16 CFR, Part 255 Guides Concerning the Use of Endorsements and Testimonials In Advertising. Believe it or not, I love these two: Commando SR or the Mission SR in the color wheat/cream/gum. They are in the men's section! I love to wear these types of shoes to school. Thanks for the chance to win! !